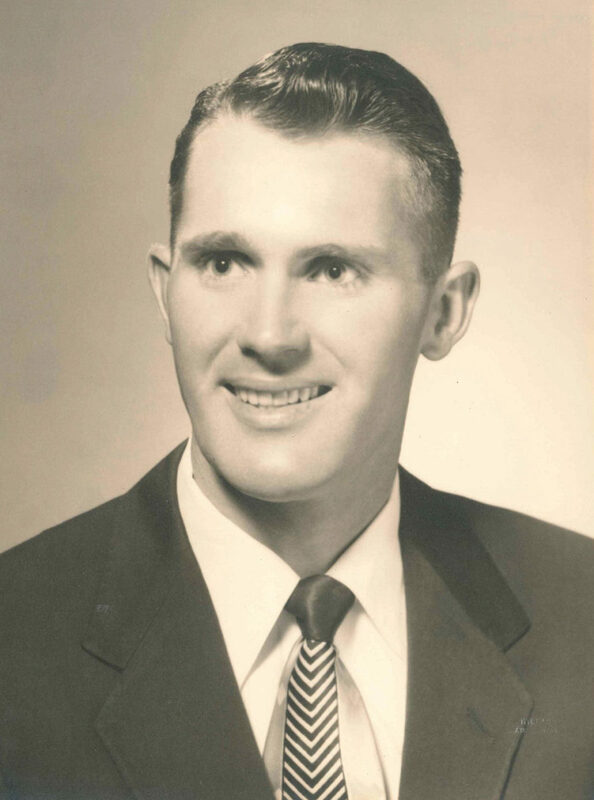 Cecil “Wayne” Byerly, age 92 of Nixa, Missouri went to be with his Lord, Tuesday, September 25, 2018. He was born May 18, 1926 in rural Poweshiek County, Iowa to Kenley C and Elsie May (Foreman) Byerly. Wayne began his education at the young age of four in rural Iowa and Clark County where he attended one room schools through the eighth grade. Wayne was engaged in farming for his Dad until he was drafted as a member of the United States Army in March 1945, at the age of 18. He served in the Philippines Islands and was assigned to the engineering department. In December 1946, Wayne was honorably discharged from the United States Army and returned to Iowa to continue farming. In the Spring of 1951, he entered Iowa State University and graduated with honors in 1954 with a B.S. degree in Agronomy. Then Wayne began his career with Pioneer Hi-Bred International Seed Company in Johnston, Iowa. On June 1, 1956 Wayne was united in marriage to Betty D. Luiken and to their union two daughters, Sherry and Karen were born. The family lived in Iowa, Texas and Michigan during Wayne’s career with Pioneer and Upjohn Companies. After retirement, they moved to a small acreage in the Missouri Ozarks where Wayne enjoyed gardening, reading, traveling and photography. Wayne was also an active member of Evangelical Free Church and served as an usher. He was blessed with good health until he was stricken with Transverse Myelitis. Wayne was a problem solver and his final years were spent researching global warming. Wayne is survived by his wife of 62 years Betty; daughters Sherry (Alvin) Vos, Karen (Andrew) Gorter ; grandchildren David (Elaine) Vos, Katherine (Nic) Padilla, Michael (Emily) Vos, Allison (Kyle) Geenen; great-grandchildren Jacquelyn, Graham, Emmett, Elizabeth, Gibson and Levi; brother Dale Byerly; sister Arlene and husband Howard Heinen; two sisters-in-law Marjorie Byerly, Ruth (Gary) Fancher and several nieces, nephews and other caring relatives. Wayne was preceded in death by his parents, brother Gerald, sister-in-law Doris Byerly, brother-in-law Keith Huisman and nephew Marvin Byerly . Funeral services for Wayne will be 4:00 P.M., Sunday, September 30, 2018 in Barnes Family Funeral Home, Ozark with Pastor Tom Semmelbeck and Pastor Andrew Gorter officiating. Visitation will be 3:00 P.M. Sunday until service time in the funeral home. Burial with full military honors will be 10:00 A.M., Monday, October 1, 2018 at Missouri Veterans Cemetery, Springfield, Missouri. In lieu of flowers donations may be made to The Transverse Myelitis Association, 1787 Sutter Parkway, Powell, OH 43065-8806. Online condolences may be shared at wwwbarnesfamilyfunerals.com. I got to meet Wayne for the 1st in December of 2017. My husband (Steven) had worked for Wayne when he was in Iowa and always looked up to Wayne. For a first time impression he melted my heart. He was a man before me that didn’t look him age let alone had a very good memory. Steven & Wayne had the same interest with Global Warming and often spoke on the phone, exchange emails or sent information to one another about it. Wayne & Steven was talking about the past & recalling events or moments. I enjoyed visiting & sitting with Wayne during his lunch. We were hoping to go back to see Wayne & Betty again however that didn’t happen prior to his passing away. Rest in Peace Wayne. Your time had come, now you are in God’s hands with no more hurting, getting told what to do and being able to get up and walk around like you wanted to do when we were visiting. You have earned your wings. GOD has another in Angel in heaven to look upon all of us. Betty, Karen & Sherri GOD be with you all in this time and for times to come. We got to meet Wayne when we lived in Des Moines. Stan enjoyed working for him one summer. He was an interesting and encouraging. We got to know Grandson, David Vos, when he was at Dordt College. Our sympathy to you as your grieve your loss.